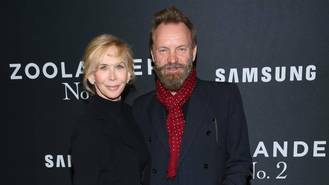 The former The Police frontman and Trudie, who are parents to four children together, are excitedly awaiting the birth of their eldest daughter Brigitte Michael's first child in early January (17). The new baby is due just after film producer Trudie's birthday and if the child arrives on time, will share a birthday with the couple's late friend David Bowie. The couple opened up about the baby during an appearance on U.S. talk show Watch What Happens Live! on Monday (12Dec16), and Trudie recalled a special memory about David, who passed away in January, 2016, two days after he turned 69. "We had similar birthdays," she said. "His was January the eighth and mine is the sixth. I was pregnant with our first baby, Mickey, and he was onstage in New York. He saw us at the side of the stage and saw my very pregnant belly and he came over and said... 'That's a girl you're having!' It was just so kind of him to see me first. And now our daughter is having her first baby at the beginning of January. We're all Capricorns." Sting's new grandchild will be born into a life of great wealth, but the baby will not see any of his or her grandparents' fortune, because Sting has decided his kids won't inherit his money. "My generation all assumed we would have a better standard of living," he told Britain's Event magazine in 2014. "The one that we spawned cannot assume that. With my children there is great wealth, success - a great shadow over them - so it's no picnic at all being my child. I discuss that with them; it's tough for them. I told them there won't be much money left because we are spending it! "We have a lot of commitments. What comes in we spend, and there isn't much left." "I certainly don't want to leave them trust funds that are albatrosses round their necks," he continued. "They have to work. All my kids know that and they rarely ask me for anything, which I really respect and appreciate. Obviously, if they were in trouble I would help them, but I've never really had to do that. They have this work ethic that makes them want to succeed on their own merit. People make assumptions, that they were born with a silver spoon in their mouth, but they have not been given a lot."